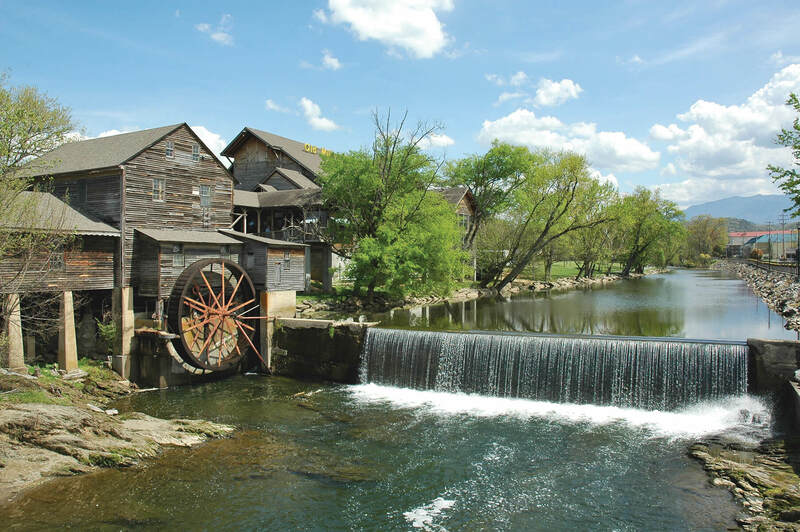 This wonderful Old Mill two bedroom cottage “Serenity Cove” is conveniently located less than one mile from downtown Pigeon Forge. Tastefully decorated with a modern charm, the cottage features a full kitchen, living room with a stacked stone gas fireplace and two full bedrooms. This cottage has an attached garage making it perfect for the car or motorcycle enthusiast. Just a minutes walk to the pool and hot tub located within the resort. Don’t feel like fighting traffic? Just walk a couple blocks to the trolley stop and downtown Pigeon Forge. A covered front porch makes the evening melt away after a long day exploring this beautiful area. We truly enjoyed our vacation to PF this would be the second time to stay in the cottages. The cottage was very clean. Being able to put the car into the garage was nice. Having the quiet neighborhood was great. We don’t even look at other accommodations as we like the cottages so much . Having the washer and dryer available is great for an extended stay (lite packing ) hope to return soon !!!!! This is the second time we have rented one of these condos and we were not disappointed. We made the mistake going to PF while the car show was there. The traffic was bad but whenever we returned to our place, after excursions out, peace and quiet greeted us. The whole condo was very clean. Being able to put the car into the garage was nice. Would definitely recommend this condo. I do hope that you continue to offer these accommodations. We love one level cottages(condos). We will be back!!! We normally stay in a cabin when we come to Pigeon Forge, but this time we decided to give the cottage a try. We were a minute from the parkway which was excellent because of the traffic. The neighborhood was quiet and felt very safe. Having a garage was awesome! We could leave our bags in the car without the fear of losing them. The cottage itself was beautiful and very clean. The gas fireplace made sitting in the living room very relaxing. The beds were comfortable and again everything was so clean. The little touches like the pottery from the Old Mill in the kitchen gave a real home like feel. Overall, we loved this cottage and can’t wait to come back!! !